The denominator of all of these proportions is the number of children who are vulnerable in at least one area of development on the EDI. CICH graphic created using data adapted from Canadian Institute for Health Information. Children Vulnerable in Areas of Early Development: A Determinant of Child Health. Ottawa, ON: CIHI; 2014. 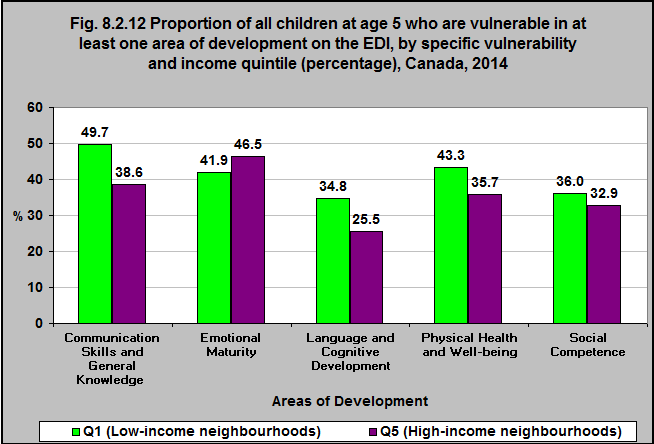 Children living in low income neighbourhoods are more likely to be vulnerable in the Early Development Instrument (EDI) domains of communication skills and general knowledge, language and cognitive development, physical health and well-being and social competence than are children living in high income neighbourhoods. Children in high income neighbourhoods are more likely to be vulnerable in the domain of emotional maturity than children living in low income neighbourhoods. The Communication Skills and General Knowledge domain includes skills to communicate needs and wants in socially appropriate ways, symbolic use of language, storytelling, and age-appropriate knowledge about the life and world around.